Baselworld in Switzerland is the largest trade show in the world for luxury watch and jewelry manufacturers, and it starts today. This Hubolt watch was just revealed a few hours ago and was coined as the most expensive watch in the show. 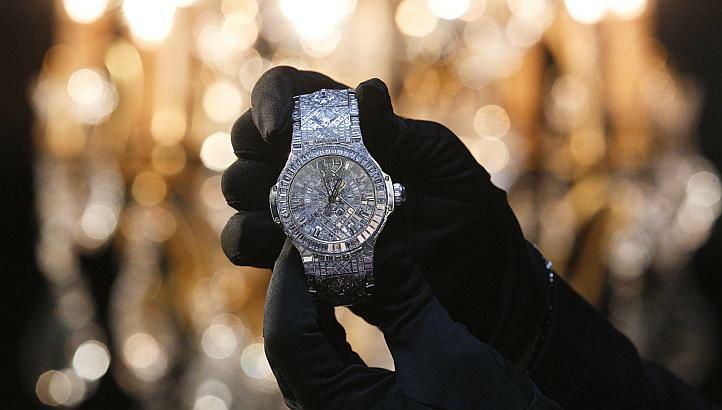 Weighing in at a mere 5 million dollars, this piece is inlaid with more than 1,200 diamonds and according to Mr. Jean-Claude Biver (the president of the company) it took 17 people and 14 months to set more than 140 carats of diamonds onto the watch’s white gold bracelet. Apparently, SEVERAL people have expressed interest in purchasing the item. Does anyone know what time it is? Glancing down at my scratched DKNY watch that rests humbly on my wrist, I think it’s definitely time for an upgrade. Unfortunately, I don’t have an extra 5 million dollars, so I won’t be purchasing this extravagant piece. It looks like it’s time to keep shopping!